Salam M. Aboujaoudé died at Memorial Medical Center on March 31, 2019 in Las Cruces, New Mexico. He was 82 years young. Salam was born on March 18, 1937 in Broummana, Lebanon to Mansour and Zahia (née Aswad), the youngest of their six children. He felt a calling to the ministry from a young age and pursued his seminary studies at Middle East University, a Seventh-Day Adventist institution in Lebanon, graduating in the spring of 1958. It was there that he met Haifa Moujabber and the two married in September of 1958 and promptly began a life of ministry in Cyprus, Iraq, Jordan, Lebanon, and, later, in the US. In the 1970s Salam also worked across the Middle East as Youth director and as Publishing Director for the SDA Church. In 1980, Salam and Haifa moved to the United States and settled in Washington State. 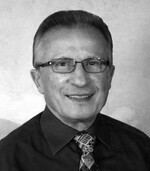 They ministered in the greater Seattle area and in Snohomish County until and beyond Salam’s official retirement in 2002. In 2014, they discovered Las Cruces and decided to make a new home in the sunny southwest where he was active in the Las Cruces Central SDA Church on Three Crosses Road. His first passion was the Word and he relished poring over biblical texts in their original languages. His second passion was selflessly helping other people. He was an accomplished woodworker and carver, an all around handyman, a great bargain hunter, and an excellent hugger. He loved the outdoors. Salam is survived by his wife of nearly 61 years, two sons and their families, grandchildren, great grandchildren, three siblings, nephews and nieces. He is preceded in death by his eldest son, his parents, and two siblings. He leaves behind a wealth of extended family, into which he constantly adopted newfound friends and loved ones. A Celebration of Life will be held on Saturday, April 27, 2019 beginning at 3:00 PM at Getz Funeral Home on 1410 E Bowman Avenue in Las Cruces. All are welcome to attend. In lieu of flowers, please send donations to Adventist Development & Relief Agency (adra.org). The family is grateful to Doctor Guido Leon and the excellent staff at Memorial Medical Center for their care. To send flowers to the family of Salam M. Aboujaoude, please visit our Heartfelt Sympathies Store.